On October 8th, radiologists and professionals from related fields celebrated the seventh International Day of Radiology (IDOR) across the globe. The International Day of Radiology is an annual event held with the aim of building greater awareness of the value that radiology contributes to patient care and improving the understanding of vital roles radiologists and medical radiation technologists play in the healthcare continuum. Cardiac imaging was this year’s theme. This was an important day to recognize all of our radiologist members. To commemorate this event there is information posted on car.ca as well as social media, well in advance of the event but also throughout the actual day. To coincide with the IDOR we hosted our annual Day on the Hill. This year’s event was remarkable. We had over 25 members of parliament and senators attend our reception at parliament and our delegates participated in nearly 25 individual meetings with MPs, senators and senior Parliament Hill advisors. This event keeps getting better year upon year, improving in the event itself but also the passion for advocacy our members commit to pursuing. 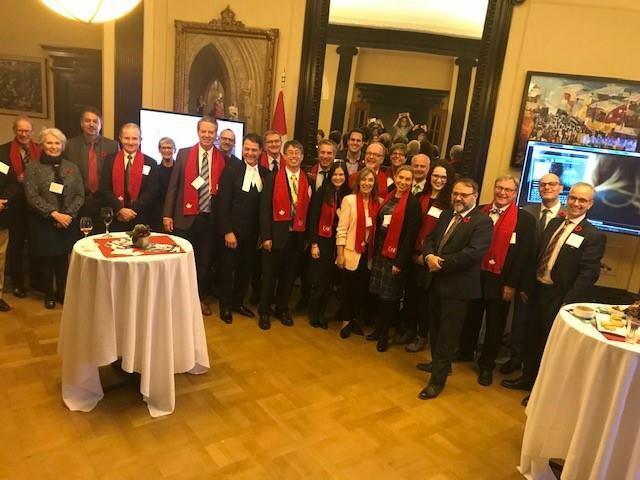 We’d like to acknowledge our radiologist members who participated in the Day on the Hill, the staff who organized the planning, as well as our corporate partners that made the trip to Ottawa to showcase the latest cardiac imaging technology. The meetings, which took place on November 6, following the reception, were very positive and a number of MPs have requested that we follow-up with their staff as well as meet them locally in their ridings. Our Day on the Hill produced a social media storm. Most notably, we uploaded an album full of smiling doctors and MPs from our dozens of productive meetings on our Facebook page. Take a look and be sure to share with your friends and colleagues. As for the next steps, we’ll be reaching out to the MPs and senators that we met with and ask them to support our pre-budget submission priorities. We’re very proud of the delegates that participated in the Day on the Hill. They conducted themselves with poise and were absolute model representatives of radiologists in Canada.